Now, with the future of Brexit in doubt, there's reason to worry that these terror cells will exact vengeance on the UK. 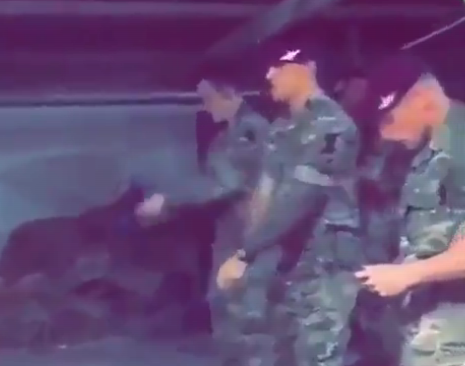 Yesterday, a video surfaced of British soldiers using a picture of Jeremy Corbyn -- who could well be the next Prime Minister of Britain -- for target practice. Other soldiers have been recorded cheering for Tommy Robinson, the founder of the English Defense League, a far-right hate group, who is now an advisor to the UKIP, the political party that led the pro-Brexit movement. Priti Patel, a Tory MP, has called Corbyn "a man who sides with terrorists and socialist dictators." The right-wing terrorist Darren Osborne -- who murdered a man when he drove his van onto the pavement in front of the Houses of Parliament -- has said that one of his goals was to murder Corbyn, saying "it would be one less terrorist [on] our streets." Labour MP Rosie Cooper gave a speech in the House of Commons about the neo-Nazis who were caught planning her assassination over her anti-Brexit stance "to send a message to the state, to send a message to this place" (the plot was not foiled by the police, but rather by the anti-fascist campaigning group Hope Not Hate, who infiltrated the terror cell and exposed its plans). Other MPs have been called "traitors" by Tommy Robinson, on the basis of their opposition to Brexit.